Guests will enjoy agro & viticultural variety of SF Bay. Journey along the Marin Cheese Trail. Visit Marin French Cheese Creamery. Visit Heidrun Meadery, learn how bees make honey and how champanized mead is made (add $15 per person, closed Tue). Visit Cowgirl Creamery in hay barn (Wed-Sun). Venture to HW1 & enjoy fresh out of water oysters from famous Marshall Oyster Store, served with clam chowder, smoked salmon, and . It's one of the 30 best seafood restaurants in the country. (add $30 ). Next stop is Wild Flour Bakery. Breads and pies from wood fired brick oven (Fri-Mon). Visit Kozlowski Farms. Fruits & berries jams, preserves, sauces, dressings. Then we will visit a few of 600 WINERIES chosen by you or recommended by us. Visit Marin French Cheese creamery store, delicious French and Swiss style cheeses Brie and Camembert. California artisan Cheese since 1865. The longest continually operating cheese company in America. Their soft-ripened brie cheeses are handcrafted today in 20-gallon buckets just like they were back in 1865.They proudly source only the highest quality milk from neighboring dairies within 20 miles from creamery to achieve authentic taste true to Marin and Sonoma. Free cheese tasting. Next visit Heidrun Meadery that produces naturally sparkling varietal meads using the traditional French Methode Champenoise. Their trademark Champagne-style of mead is light, dry, delicate and refreshing, with subtle aromats found only in the essence of honey. 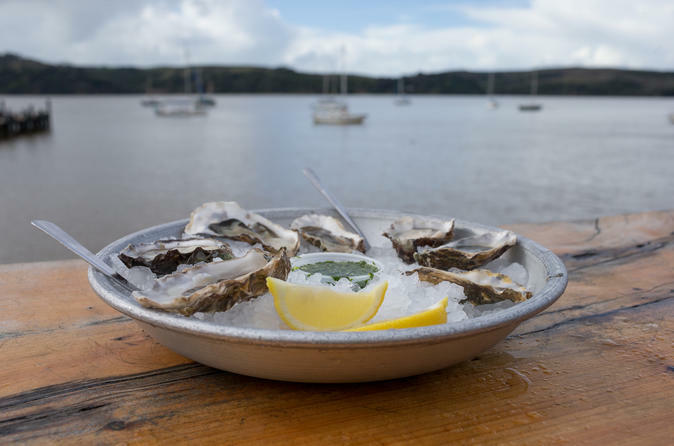 Visit the famous Marshall Oyster Store on HWY 1 on narrow and channel-like Tomales bay. This seafood shanty with makeshift tables overlooking Tomales Bay is the place for the area’s famous oysters. Start your meal with a bowl of famous Clam chowder, then pair your oysters with crisp white wine, add salmon and trout smoked just outside and enjoy views of bobbing boats. Visit Kozlowski Farms that produces BBQ, steak and seafood sauces, butters-fruit condiments, chipotle grilling & dipping sauces, marmalade, dressings, vinaigrettes, jams, jellies, preserves, mustards sweet and hot, spreads, pies, syrups, vinegar, gift baskets and boxes.